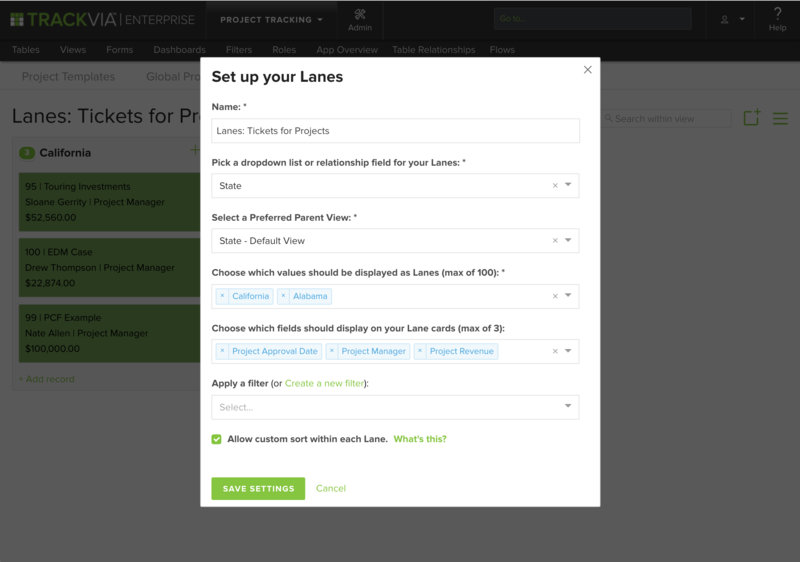 Lanes views, also known as Swimlane Views, have been given a fresh look and additional functionality! We've added more flexibility in building lanes/columns, sorting your cards and choosing what is shown on each card. Parent values can be used as lanes! 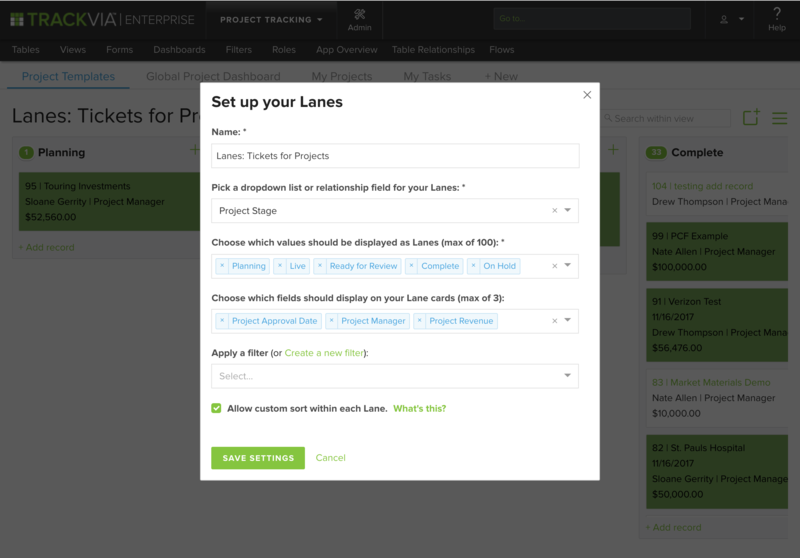 Now you can use a relationship field to to create your lanes. For example, if you have States as a related Parent table to your Projects table, you can now select States to build a Lanes view. A custom vertical sort can be enabled and saved for that view. This will allow you to drag & drop a card to a specific spot within a lane and save it in that spot. This works great when you need to prioritize your cards within a Lane! You can select any dropdown or relationship fields you have in your view to display as Lanes. Additional fields can be added to a card (up to 3). This is great to see more information at a glance when viewing your cards. To start, you must create a custom view. If your view contains a Dropdown field and/or a Relationship (Link to Parent) field, you will see the Lanes option in the hamburger menu of the new view. Click the Lanes option to open the Lanes Setup window. You may edit the View name here. Choose the Dropdown field. In the above example, we have chosen Project Stage. Choose the Dropdown values you want to use as lanes. The order you choose will be the order in which the lanes are displayed. One hundred (100) is the maximum number of lanes. (Optional) Choose the display fields for each card. The Record ID will always be used. You may choose up to 3 more fields. (*) The order you choose will be the order of the fields displayed. (Optional) Choose a filter or create a new filter. (Optional) Check the box to allow custom vertical sorting within the lane. Choose the Relationship field. In the example above, we have chosen State as the Relationship field. State is a table connected to Projects. Choose a Preferred Parent View. 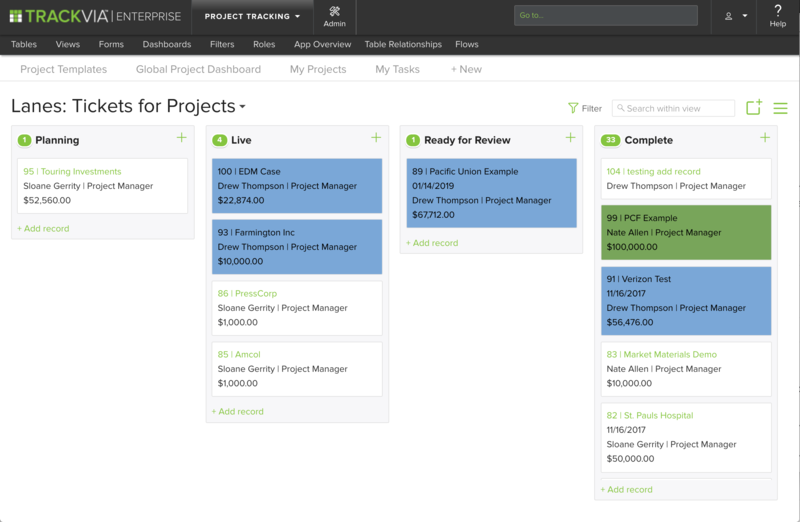 Best Practice is to create and choose a Custom View (i.e. not Default even though that is what we are showing above). (Optional) Choose the display fields for each card. The Parent Record ID will always be shown. You may choose up to 3 more fields. (*) The order you choose will be the order of the fields displayed. (Optional) Check the box to allow vertical sorting. All field types are available to display on a card except Image, Document and Checkboxes. Location fields will be the text values for Lat and Long. URL and Email fields will display as text (not clickable). "Create New View" has been removed. "Edit This View" takes the user to the general View Builder instead of the Lanes Setup modal. Use "Lanes" to create and edit a Lanes view. All email shares will show a grid view of up to 250 records. An ad hoc (immediate) share will show only the records for the chosen columns of the view. Scheduled shares will show records for all the columns regardless of which were chosen to display. Existing Lanes views will display as expected. Choose the Lanes option to edit. Users with edit permission will still be able to drag a card from one lane to another. Users without edit permission will not be able to drag a card vertically to re-sort a lane even if the Admin has enabled the option. iOS will continue to render a grid for all Lanes views. Android will continue to render a Lane view when it is created with a Dropdown field. As before, all columns will display. As before, each card will contain the Record ID and 1 display field only. Android will render a grid view for a Lane view created with a Parent relationship. Some users were having trouble saving changes to Quick Filters when many tabs of the same browser window were open. This is now fixed. A limited user without permission to delete records was seeing an "X" (delete icon) in a Lanes view. The "X" to delete no longer displays for that user. Changes to a Lanes view which contained a relationship (Link to Parent) field were causing errors and not saving. With the Lanes Enhancement release, users can edit Lanes views that contain relationship fields. Some fields were not displaying custom formatting in the Audit History of a record when the record was viewed from a custom form. This is fixed.